We offer a range of BPO & Back Office services to Global businesses. In general, the process of outsourcing specific business functions to a third party BPO Company is called Business Process Outsourcing. Businesses can outsource the core and non core business functions to BPO companies to reduce cost on overheads, get specialized services and faster TAT. The usual practice by companies are to outsource operations, back office clerical activities, Accounting functions, HR functions, Sales & Marketing, customer support, IT support services, Procurement etc. This will give opportunities to companies to explore skilled talents from the BPO Company and at a lesser cost. The BPO companies can provide flexibility in terms of deliverables, costs, meeting deadlines and implementing technological advancements. We at Infosearch involve domain experts and well trained executives to execute our clients' projects. We specialize in providing back office support to Invoice factoring companies, approached by the customers for quick money. It involves understanding the customer's expectation with respect to Insurance, Cross verifying various documents etc. In accounting and financial outsourcing, we promise for confidentiality, data security, risk management and improved efficiency. Pay-roll administration, training & development, record keeping, performance appraisal records etc. Product management, cart management, offers and deals, order fulfillment, customer support, after sales support etc. Management of essential operations such as policies, processes, data equipment, human resources, & external contacts. Today’s business demands high quality service at a lesser cost to compete in price driven markets. The outsourcing model helps businesses to focus on R&D and new initiatives to provide new products and services to their customers and to sustain in the competitive markets. We at Infosearch offer specialized BPO services to our clients. The clients can reduce their operational overheads by outsourcing. The outsourced activity will be performed by trained executives and manager to deliver the best to our clients. Each outsourced process will be executed by trained and experienced professionals. A detailed process flow is derived in consultation with the clients to provide a quality service. Our team will be in touch with the client regularly and periodic reviews will be conducted to evaluate the operation and to fill the gaps. We at Infosearch use best of technological solutions like CRM, voice services, remote desktop, VPN connectivity, web conference tools, Project management tools etc. 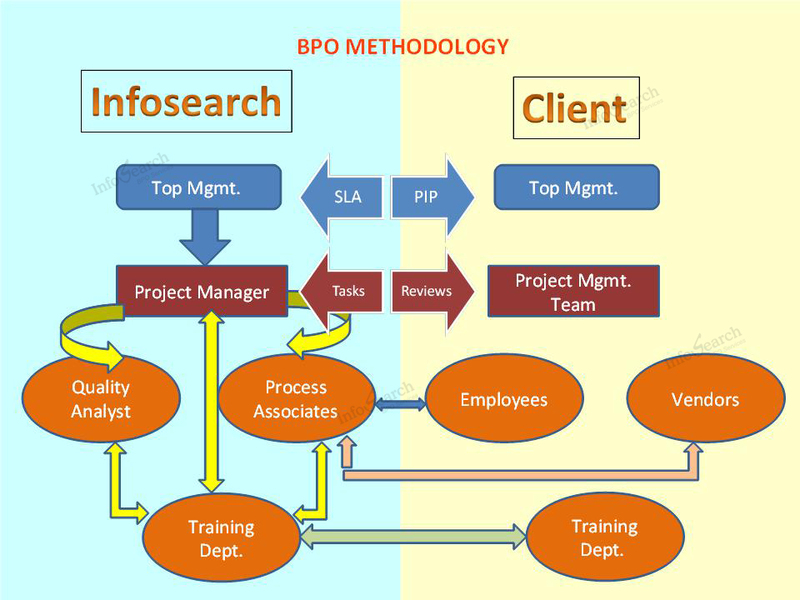 The following is a general Business Process Methodology which will be customised as per the client's requirement.